The forthcoming book Twitterature: The World’s Greatest Books, Each Presented in Twenty Tweets or Fewer, is based on an idea with formidable marketing potential, to be sure. But I’m concerned about staying power. If the demise of Myspace is any indication, most social media sites can expect only about 18 – 24 months of relevance. Were the popularity of Twitter to wane in a year or so, I fear Twitterature would end up in both literal and figurative bargain bins, and the authors would be forced to write jokes for Carson Daly monologues or another similarly degrading fate. For the book’s product tie-in, wouldn’t it be better to go with a brand that has a longer shelf life than Twitter? I’m thinking of a brand that has considerable longevity. Thanks to the magic of preservatives, so does the item itself. I’m talking, of course, about Cheetos. Filtering great literature through the Twitter brand is a fine idea. But I think you can do more by Cheeting the classics instead of Tweeting them. So, I give you five entries from the hypothetical book project Cheetorature. In return, you should give me a two-book deal with a signing bonus. Macbeth—By smearing Cheeto remnants on the servants’ hands and on the neck of the lifeless Duncan, Lady Macbeth cleverly frames those servants for strangling the former king. The new queen is haunted by both her crime and her diet-busting choice to eat the entire bag of Cheetos she used in the deception. We later see her, in a reverie of guilt, scrubbing incessantly at the Cheeto residue that just won’t come off her hands after the regicide and the snacking. Of Mice and Men—The pitiable man-child Lennie, physically dangerous but not malicious, loves tending rabbits and eating Cheetos. In the book’s tragic climax, Lennie accidentally kills his boss’s son’s wife while merely trying to stroke her soft hair. The greasy orange streaks in the victim’s hair only confirm what Lennie has done. Fear and Loathing in Las Vegas—On their second night of desert decadence, Raoul Duke and his attorney eat acid-laced Cheetos. 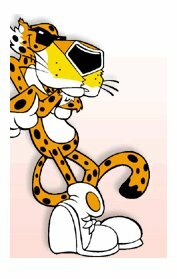 An hour later, iconic cartoon spokes-cat Chester Cheetah leaps off their snack bag and grows to human size. The trio hit the Strip and booze it up ’til dawn. The Bible—Noah builds a Cheeto-shaped ark. The Messiah feeds the masses with two fishes and five Cheetos. In the Book of Revelation, the Four Horsemen of the Cheetocalypse ride powdery orange steeds and deliver unto the world Conquest, War, and Death (but not Famine, what with all the Cheetos). Cheesus, the Bible’s potential is limitless!